Ever since the live-action / CG hybrid in 2010’s Alice in Wonderland, Disney has been churning out live-action remakes of some of their classic features from yesteryear. From the Sleeping Beauty twist of “another side, another story” in Maleficent, to the whimsical classic retelling of Cinderella, to the deeper tone of The Jungle Book, each of these movies imbues the beloved story with n live-action facelift of practical / visual effects, while also still retaining the core essence of the tale, whether by Disney’s brand or its longtime tradition as a narrative. Now, reaching deep into its vaults within its illustrious catalogue of movies, Disney and director David Lowery bring another reimaging of a classic to the big screen in the film Pete’s Dragon. Does this movie take flight with nostalgia and wonderment or is it a fanciful remake flop? 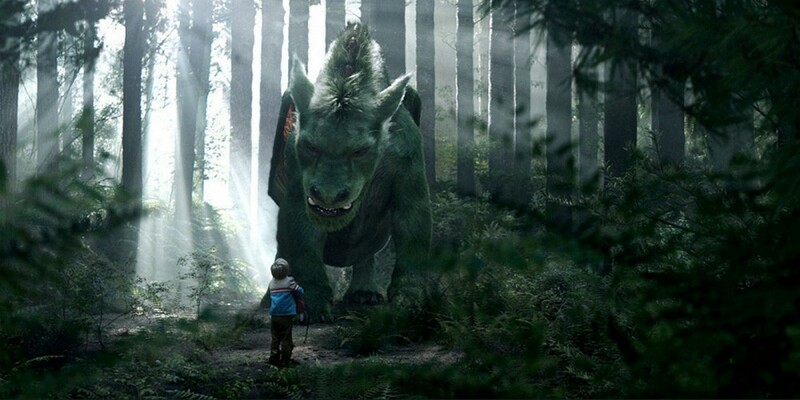 Hit by a tragedy at young age, Pete (Oakes Fegley) was orphaned five years in the deep northwestern woods, befriending by Elliot, an enormous green dragon who immediately forms a bond to protect the boy, making a home for the two of them from human civilization. With the forest threatened by a logging company overseen by Gavin (Karl Urban), Pete encounters Grace (Bryce Dallas Howard), a local forest ranger who can’t believe a little child has managed to remain alive for this long. Taking in by Grace, Pete shares stories and drawings of Elliot, but Grace is having difficulty separating fact from fiction in the young boy’s story, seeking help from her dad, Meacham (Robert Redford), who always talked of a brief run-in with a green dragon, but everybody treats it as a “tall tale”. While Pete soon warms up to Grace, her fiancé Jack (We Bentley), and his daughter Natalie (Oona Lawrence), Gavin is determined to capture Elliot, rallying armed men around to secure the magical being, urging the young boy to return to his forest home to help his friend. Being a big fan of all things Disney, it goes without saying that I’ve seeing all of Disney’s recent live-action remakes. Alice in Wonderland and its sequel (Alice Through the Looking Glass) were okay and Maleficent had an interesting premise (and a strong lead in Angelina Jolie), but was a misfire in its reworkings. After that, however, they have been getting better with Cinderella and The Jungle Book, both of which I love immensely. I remember hearing that Disney was going to remake of their 1977’s film Pete’s Dragon, thinking it was going to a “hit or miss” experience as the film really didn’t scream the demand to be reimagined for new audiences. Then I saw the trailers for the new movie and those definitely peaked my interest in seeing it, but still had some leery thoughts about this remake. Heck…after seeing the teaser trailer for Disney’s upcoming live-action remake of Beauty and the Beast, Pete’s Dragon seem less than desirable. However, that being said, my concerned thoughts and expectations were shattered as the 2016 remake of Pete’s Dragon is a wonderful film that’s full of whimsical magic and tender heart. Bringing this remake to life is director David Lowery, who has previous directed several short films and some indie feature films including Ain’t Them Bodies Saints. Personally, I think it’s an interesting choice that Disney decided upon Lowery (a low-key director) rather than choosing a big name / well-known director to helm Pete’s Dragon. After seeing the movie, I think it was a right choice. While some directors might’ve taken the movie in a grandiose direction and indulge several visual flourishes, Lowery keeps the feature small, which is actually a very good thing for the feature, as it keeps the narrative focus primarily on Pete, Elliot, Grace and the rest of the principal characters. This being a remake of the 1977 feature, it would be easy work for Lowery and Toby Halbrooks (both of whom penned the film’s script) to bring a carbon copy narrative to this 2016 movie. Thankfully, Lowery and Halbrooks don’t that, keeping the 2016 version inviting / familiar with the same core fundamentals of the original version, but retains its own identity to discern from its predecessor. Like a lot of children movies (both new and old), Pete’s Dragon is a coming of age tale, utilizing a lot of familiar themes and messages throughout. Some might grumble here and there about the film’s overtones in this regard (feeling a bit syrupy of goodness / dramatics), but (to me) it keeps the film on-point and engaging in its narrative’s plot. In conjunction with that, Pete’s Dragon is very heartwarming and well-crafted (handled with love and care) and I say this truly and without sarcasm. The film points out the classic issues of family, friendship and loss, but in a very accessible way that’s appropriate for a PG rated film. You’ll laugh a bit, tear up a bit, and believe in the friendship between a boy and his dragon. Pete’s Dragon also has a sort brings a “timeless” feeling to the proceedings. What do I mean? After a bit of research (after seeing the movie), the film’s time period takes place in the early 1980s and (to be honest), you really wouldn’t know that. That’s because Lowery doesn’t over saturate the movie with superfluous 80’s pop culture references (basically he doesn’t make the point of the film to say what the time period is). Even the film’s setting is placed in a sleepy and secluded town, which kind of has a story book feeling to the movie (in a good way). It’s funny…I first thought it the film’s time period was set in present day. In short, Pete’s Dragon doesn’t make overt gestures to mention and showcase its time period, but rather uses a subtle “timeless” approach in that regard, utilizing a “small town” premise as a backdrop for its narrative. Of course, the big star in the film comes in the form of the mythical green dragon named Elliot, Pete’s loyal friend and protector / caretaker. While he can be a formidable presence in size and scale of being a mythical creature, Elliot is a great and adorable character (its definitely hard to resistance his charm). While he has dragon-like attributes, the design / persona of Elliot is more like a dog (fur, canine-like nose, and pronounced lower jaw). While he has the typical wonderment of innocences, Lowery and the visual team of WETA Digital (the wizards behind The Lord of the Rings, The Hobbit, and Narnia) imbue Elliot with expressive facial features that are so amazing to see and definitely help bring the character to life. While he may not be the most highly detailed CGI rendered dragon (that still belongs to the titular Smuag from Peter Jackson’s The Hobbit trilogy), Elliot is the most loveable and expressive dragon ever to grace the silver screen. Sharing the spotlight with Elliot is the character of Pete, who is played Oakes Fegley. In a similar fashion to Ruby Barnhill’s performance in Spielberg’s The BFG, Fegley, a relatively known child actor, is fantastic in the movie as Pete, crucial central piece to sell in making this movie. Fegley has a natural child-like wonderment and an endearing foil to his human cast members as well to Elliot. Their relationship (Pete and Elliot) is so heartwarming and believe that I actually began to tear up a bit at one tender moment (it’s the truth). I mean…if a movie can do that to me, sharing an emotional bond between a one human character and a CGI rendered character, then the movie has sold me on its heartfelt friendship between the two. And that’s a really good thing. Bryce Dallas Howard plays Grace and, while her character isn’t exactly original, Howard still display a good wholesome theatrical talent to make her character presence known in the film. The same can be said with Oona Laurence (I loved her Southpaw. I know I mentioned that before in my Bad Moms review, but she was great in it) as Grace’s fiancé’s daughter Natalie. 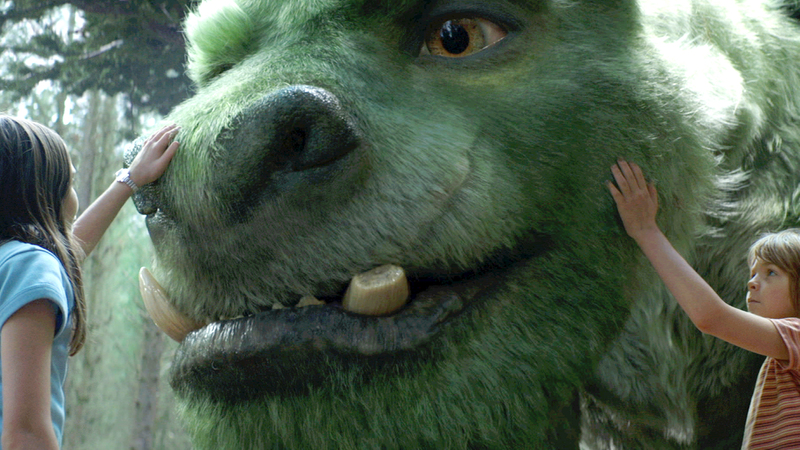 Much of the rest of the adult characters (supporting characters) in Pete’s Dragon, including Wes Bentley as Grace’s fiancé Jack, Karl Urban as Gavin (Jack’s brother), and seasoned actor Robert Redford as Grace’s father Meacham are stock-like characters, but are slightly elevated due to the actors who play them. An example of this is in Urban’s Gavin, who sort acts as the film’s antagonist but sort of not. The character isn’t evil or villainy, but rather a flawed person. It’s an interesting notion, but too much to it nor well-rounded. Cultivating to what I said above, Pete’s Dragon feels small in its scope, but the movie itself is beautifully crafted like Lowery’s indie feature works. In a sense, the movie doesn’t need to be big or grand sweeping tale, but the visuals and the cinematography (done by Bojan Bazelli) are exceptionally, creating a setting that’s somewhat familiar in its sleepy town setting, while bringing an ethereal mystic feeling within its forest realm (thanks to its real-life location in New Zealand). 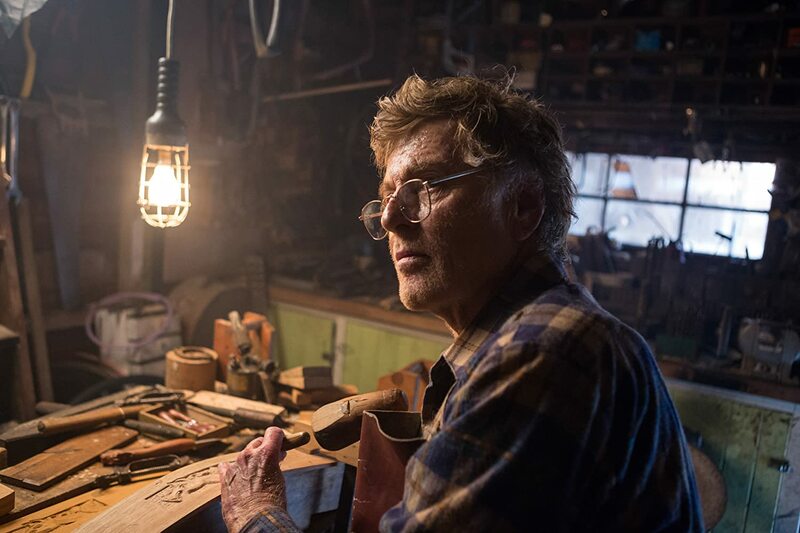 The film’s music selection and score (composed by Daniel Hart) also helps elevate the movie’s overall feeling with slow-paced / mellow songs from various artists and with Hart’s score of whimsical melodies and sweeping flourishes. 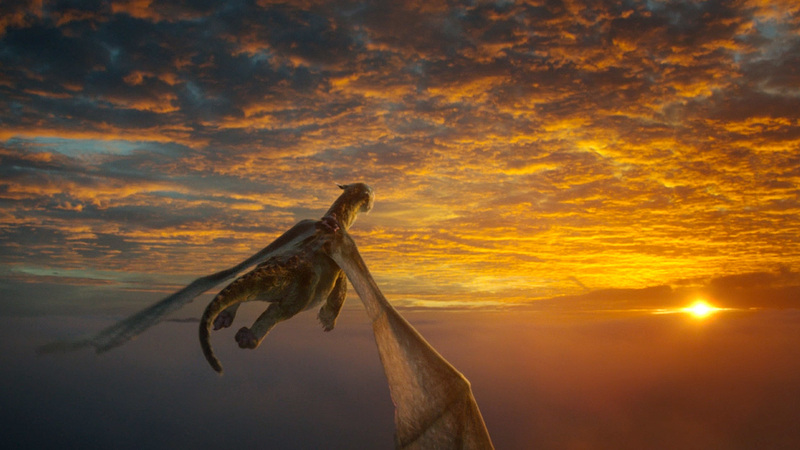 Pete and Elliot take flight in Disney’s updated reimaging of their classic movie Pete’s Dragon. Director David Lowery retelling of the 1977 film does succeed, bringing the same fundamentals from the original feature, but also allows this 2016 iteration to stand on its own with loveable tale of family and friendship. While may some minor problems here and there, the film is completely endearing with a touch of signature Disney magic of cinematic warmth and child-like wonderment. I really did like this movie, meeting my expectations and fully enjoyed this remake jaunt of this Disney classic. That being said, I do highly recommend this movie for viewing, easily accessible to the newer generation as well as those who have fond memories of the original. With Pete’s Dragon and the rising expectations of Disney’s upcoming fairy tale remake Beauty and the Beast (due out in March 2017), it seems that the “House of Mouse” is heading down the right path with their reimaging of their classics, infusing new cinematic filmmaking features with old story magic. I wasn’t sure about seeing this movie, but I think I’m going to go and see it now. Thanks. Your welcome….hope you like it! Saw it last night. Was pleasantly surprised at how much I enjoyed this film. Nice. Yeah, that was the same with me. I didn’t expect much from this movie, but I was surprised that I like it so much. Great analysis. I completely agree. This movie reminded me of ET or Old Yeller more than the original. I loved it! I’m a little resistant to the 3D realistic rendering of the dragon, because the cartoon is stuck in my head permanently. But I’ll still give this a try when it comes to our cinemas. Thanks for the review and feedback. Your very welcome. It is a good movie and a 3D rendered Elliot is amazing!